Shaw's conclusion is probably not drawn from a scientific longitudinal study, but rather from his observations of the human condition. For me, Thoreau's observation that "the mass of men lead lives of quiet desperation" echoes the same sentiment. During a discussion on thinking, a psychiatrist friend told me, "Dale, people pay me a lot of money per hour to help them with their problems. But, after I ask them the second question, they say, 'I don't want to think about it,'" essentially verifying Mr. Shaw's conclusion. I googled that question and could have spent quite a few hours on just the first page of the 832,000,000 hits. The question is at the forefront of much psychological and philosophical discussion. It is also at the forefront of society as we continue to encounter seemingly mindless events occurring on the highways, in the marketplace, and also portrayed in a never-ending parade of stupid stuff on Youtube. 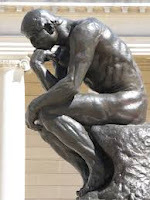 Is thinking simply brain activity? All the random things of consciousness occurring in the mind? 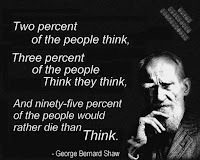 Is there a difference between thoughts and thinking? Napoleon Hill made a fortune by suggesting that all one had to do was think in order to become rich. Ever since the time of Plato, we have held the idea that rational thought is the key to solving any and all of life's problems. However, there is mounting evidence that such might not be the case. Jonah Lehrer points out in his book, "How We Decide" that there are many times when we simply 'overthink' a problem. In his chapter titled "Choking on Thought," he gives case studies of how thinking destroyed performance. These examples, however, are only samples of the misuse of the thought process. They are not proofs that we are not to think. We have been given a mind, and we are to use it. 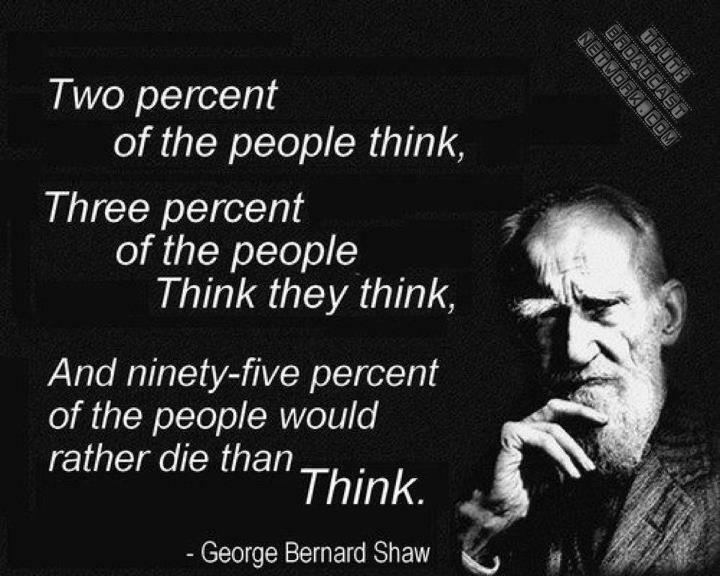 It has the ability to think, and that is what we are to do with it. We are not to forego such for any reason, especially our own ineptitude or laziness. However, it is a skill that must be developed through regular use. We too often go through life acting on impulse. "What were you thinking?" is a constant refrain we hear from the time we are children in our parents' home. For many, it continues to be uttered in their direction long after they have left home. And the answer continues to be the same—"I dunno"—because conscious thought was not a part of the process. The lack of consciousness is at the heart of most of our catastrophes we call accidents, whether on the road, walking down the sidewalk, or whatever. The failure of human judgement most often traces back to a lack of consciousness. We now live in a world where everything around us militates against our being conscious of the moment. We are distracted on every side through every sense by those who want our attention. We are now so addicted to distraction that "just say no" is not an option. We no longer have the will or even the desire to not be distracted. The result is an armada of instant push notifications to our mobile devices that take our attention away from the things we need to do on a daily basis. It makes us feel rushed. It subtracts from the amount of effort we’re able to offer to a given task. And it tires us out. Stress levels are at an all-time high and on the increase, yet we continue to add stressors to our lives without so much as a second thought, because "I have to." Driven means that someone or something else is at the controls of our life. That is not a pretty picture. It is not a gentle thought. It is, actually, quite harsh. Does the thought that you are driven feel good to you? Therapy is certainly an option, if you have the money. "Stop the world, I want to get off!" has been tried, and failed. Christians, who are not immune to this phenomenon (but should be), have a way made available to them to eliminate the stress, and remove themselves from many of the causes of stress. However, it requires doing that thing we talked about in the opening—thinking. Most of our personal problems could be solved by exercising this one skill. Interestingly, though, I am not talking about a controlled reasoning out of the pros and cons of a chosen scenario. No. What I am talking about is taking control of your mind, no longer allowing it to be driven but, rather, to become the driver. We will begin to address some of the possibilities for doing so in the next article. For the time being, however, I will leave you with the single most important truth that you can begin to practice right now, this instant. Master this, and you won't need any of the tips I will be sharing with you.